Welcome to Coral Lakes, an active adult community nestled in the heart of Boynton Beach. Fabulous 2/2 plus den is light and airy. Vaulted ceilings, skylights, neutral tile floors in the main living areas and wood look flooring in both bedrooms. From the minute you walk through the front door, the gorgeous lake views take your breath away! The large kitchen has plenty of counter space, cabinetry and an extra pantry. The kitchen is open to an inviting family room overlooking the lovely patio and expansive lake views. Terrific clubhouse with resort style swimming pool and poolside cafe. The club offers tennis, pickle ball and a multitude of social events! This is a MUST SEE! 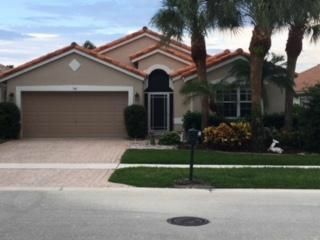 This home is located in CORAL LAKES III, Regency Cove North 55+ Active Adult Community. As an Active Adult Community Specialist for over 16 years, I know these communities very well. I am a real estate agent who cares. I don't just want to sell you a house, I want to sell you the perfect home that will fit your needs as well as your lifestyle. I live and play in an active adult community and the lifestyle is wonderful. Country Club living without the country club fees. To All of my baby boomers not quite 55 years old who want to live in a 55 plus community, please call me for a list of Active Adult Communities that will allow you to live in some of these wonderful communities! Please call me with any questions that you may have at (561)-306-7430.